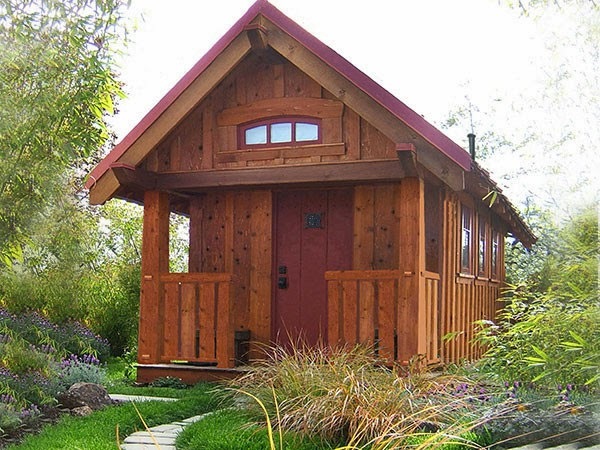 I have a new obsession: looking at tiny houses on teh intarwebz. The definition of a tiny house varies, but it's basically a dwelling, 1,000 square feet or less in size, that's meant to be lived in full-time. The form varies, but the cutest ones look like regular stick-built houses -- except they're tiny. Take, for example, this Fencl (since renamed the Cypress 18 Overlook) by Tumbleweed Tiny House Company. Inside, it has 176 square feet, including the sleeping loft. Yes, it's built on a trailer chassis; no, it's not a glorified RV. Well, maybe it is a glorified RV. You can get RV financing for it, and local building codes don't apply because it's not a fixed structure. But it's designed and built to be a four-season permanent dwelling. And if you get tired of the view out the windows after you've parked it, you can hook it up to your vehicle again and move the whole house. You can buy the plans and build it yourself for about $27,000 worth of materials (the designers' estimate), or Tumbleweed will build the whole shebang for you for $66,000. Then there's the Marmara, a slightly bigger model -- 284 square feet -- offered by Four Lights Tiny House Company. You can put this model on a trailer, too, or you can build it in a fixed location. This one's got an Arts and Crafts-style feel to it, doesn't it? Four Lights won't build it for you, but they will sell you the plans so you can build it yourself. Their estimate for materials only: $24,800 if you build it on a foundation; $29,500 if you build it on wheels. Labor, of course, is extra. But many of these places hold workshops where they teach you how to build the house yourself. And note those price tags. If you've done any sort of real estate shopping in the US recently, you may be beginning to understand the appeal these little houses have for some folks. 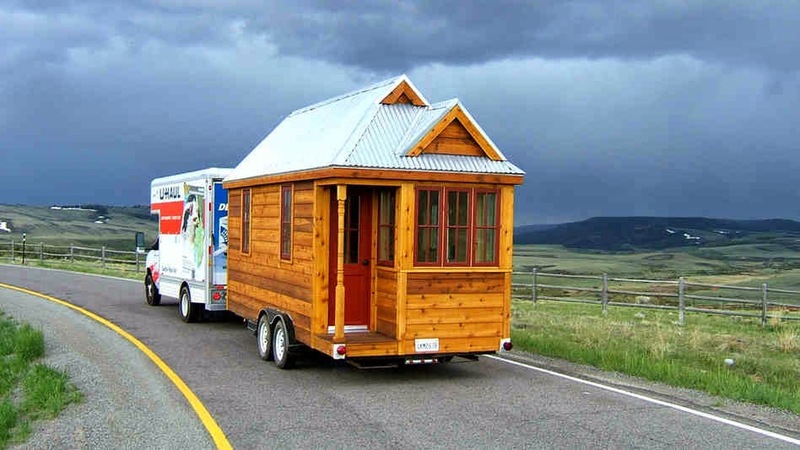 Yes, there's downsizing involved; yes, you'd be living in a space the size of an RV; no, it's not for everybody. But you sure can't beat the price. Of course, there's more to the tiny house movement than the cost. Environmentalists may appreciate the small ecological footprint. And too, the smaller the house, the less upkeep it will require, and the smaller the space to clean. Of course, it also means you'll have less storage space; if you're a packrat, you'll have a tough time making it work. But you don't have to go all that small. 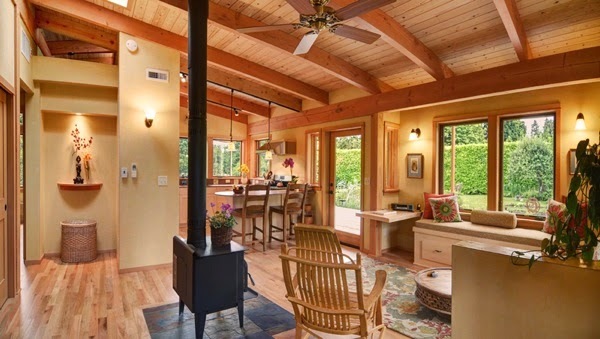 A couple in Oregon hired an architect to design an 800-square-foot home for them. Here's a shot of the interior. The kitchen is in the rear of this photo. Looks pretty spacious, doesn't it? And I wouldn't even have to downsize; my current apartment is 850 square feet. It would, however, take a lot of downsizing -- probably more than I'm willing to do -- to move myself into one of the truly tiny houses. And I can see the whole sleeping loft thing becoming a problem, the older I get; I would want a place with a bedroom on the first floor. But those little houses on wheels sure are adorable. It's official: the first draft of Scorched Earth is done. I finished it on Tuesday, but Camp NaNo validation didn't start 'til Friday and it's been a busy weekend, so I didn't have time to validate the book 'til tonight. The official word count, including the section of the first chapter that I wrote before the start of April, is 61,611. I expect that will change in the final draft. But in any case, it's done, and it's already begun ripening. Barring any really stupid plot holes or other crises, I think we're looking at publication toward the end of May or in early June. As always, stay tuned for more info. have been brought to you, as a public service, by Lynne Cantwell.